Why had stuffing always been such a hard one for me? I just hadn’t found a stuffing recipe I love. I look at stuffing recipes and get completely overwhelmed. After all, there are usually no fewer than 28 steps to take to go from bread to stuffing. Oh look. We made toasted bread. 1. Cube and toast bread. 2. Brown sausage with onion and sage. 3. Stir everything together with a few other ingredients. Some may prefer their stuffing with additional spices. Many like celery. But this turned out plenty flavorful for us with very few ingredients. Plus, not one of the six of us likes celery. So I skipped it. This recipe can be made ahead of time. 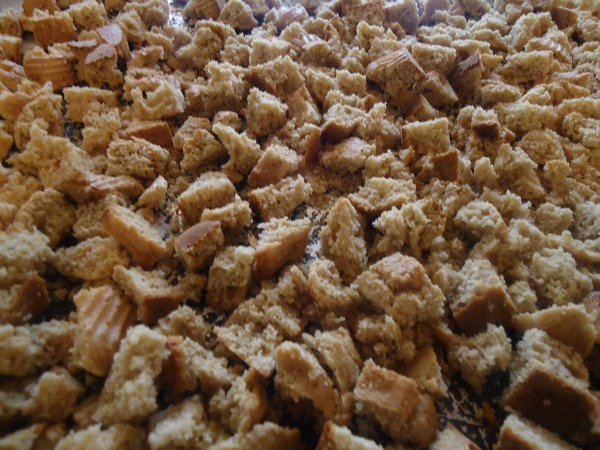 You can make this stuffing spread into a dish or as scooped into muffin tins. I may actually make this more than twice a year for holiday meals. After all, when I was was testing driving this recipe to make it as easy as possible, my family dug in and kept going back for more. Even if I did burn the first batch. Indeed, my pictures feature over-baked Stuffing Muffins. It’s because I was baking them while having unfortunate cat drama. 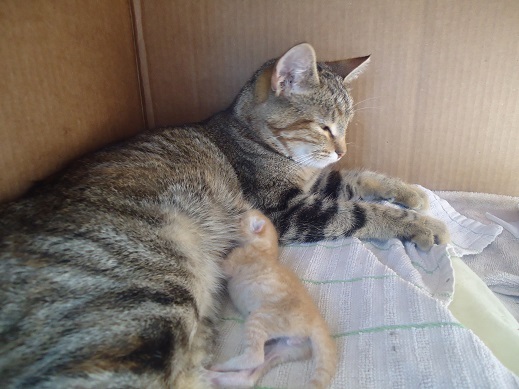 It was day 2 of baby kitties and Wiggams wasn’t sure she was cut out for the mama business. (WHAT?!) I told her she didn’t have a choice, that sometimes we all have hard days, and that she needed to get over it at go try to keep her last baby alive (yes, we’re down to only one). She ignored me. So I was trying to keep the last kitten alive by holding it to warm it up and by giving it milk from a dropper. This is when my muffins burned. 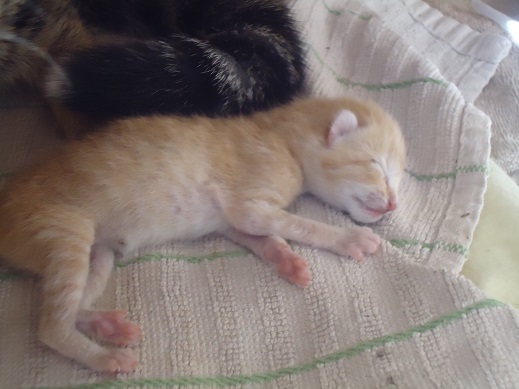 I am not cut out to be the mother of a kitten. Other bloggers would have started over in an effort to take better pictures. Me? I just took pictures of my burned muffins. There just are not enough hours in the day, okay? I get overwhelmed easily. It was either burned pictures or no pictures. At least we saved the kitten. Allow muffins to cool completely. Place them in a freezer bag and seal, air tight. Freeze for up to one month. To reheat: Thaw and warm muffins in a 250° oven in a covered dish for 10-15 minutes. 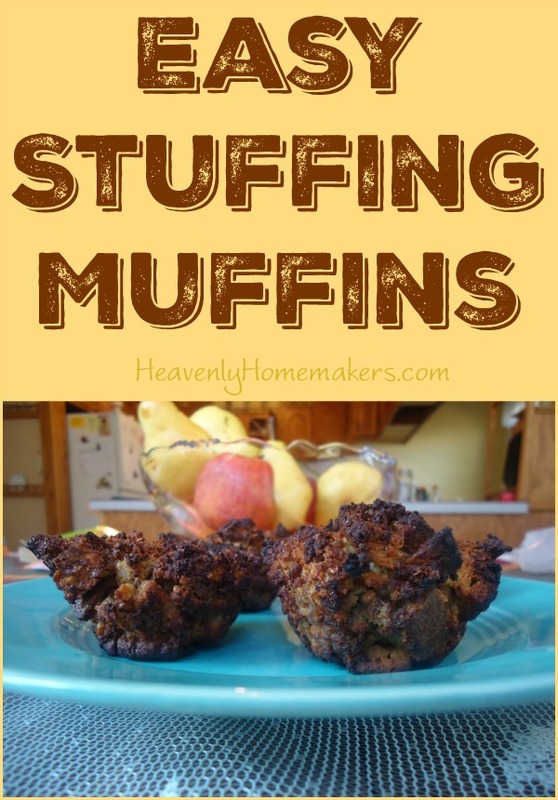 You should know that saying Stuffing Muffins most often comes out of my mouth as Muffing Stuffers or Stuffern Muffings. It can’t be helped. Look at this little one’s face. See why we named it Lionel? (I mean, besides the fact that we named it after Lionel Messi. He just looks like a Lionel.) Look at his little lion cub face. We are in love. And that is why my muffins burned. 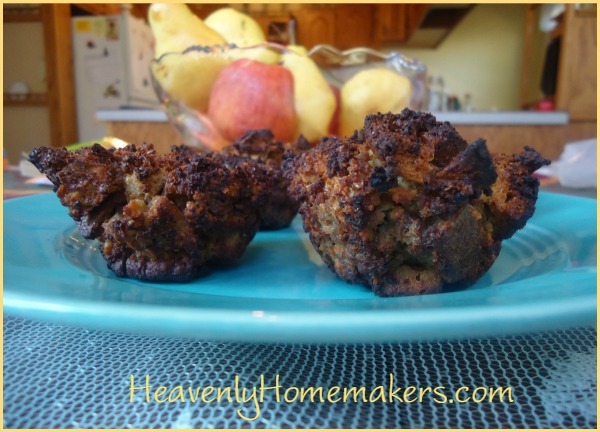 If you are in charge of stuffing for this year’s holiday festivities, I suggest you make these Stuffing Muffins at least two weeks in advance. Freeze them until the night before your meal. Thaw in the fridge. Rewarm just before serving. These are great drenched in turkey gravy (recipe coming up during this series). Getting Ahead for the Holidays – Join Us! 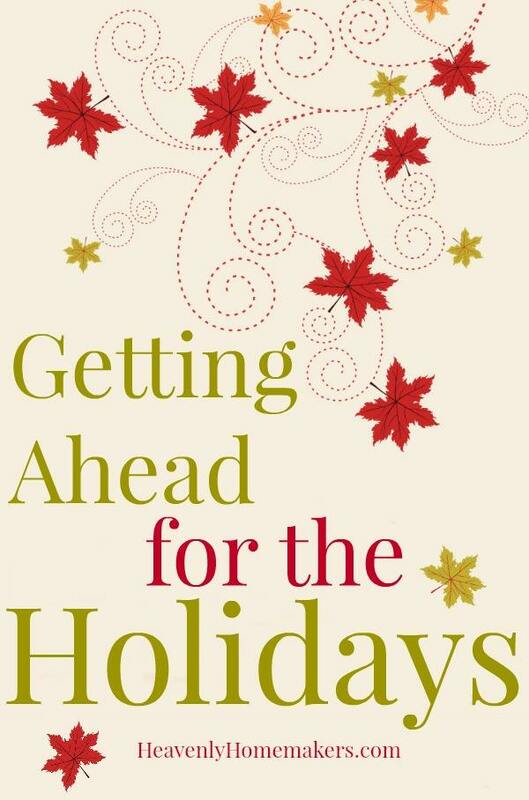 There is oodles of info out there about how to have a simple season and how to relax and enjoy the holidays. I am all for it. Why go overboard and make life complicated? Pinterest can keep its 14-step recipes and perfect looking hand-crafted gifts. I’ve gotta stick with the basics. But still. Making a holiday special means that I’m going to do extra work on top of all my normal work. There’s no way around it. No matter how simple I keep our holiday festivities, the cookies don’t bake themselves. Packages don’t arrive if I don’t order them. The turkey stays frozen when not baked. I could go on. Now, I can keep things simpler if I buy pre-made food and gift packages. Sometimes I do. Sometimes in the name of saving my sanity, I feel that it’s worth the extra money and the gross ingredients (don’t read the label, don’t real the label, what you don’t know can’t hurt you, do not turn that package over!). But overall, I want to save money and put delicious real food on the table. While keeping life simple. Is it even possible? This is the best way I know to keep life simple during the holiday season. If I do everything last minute, I enjoy nothing. But if I do a little each day in advance, prepping food and gifts and decorations – I can actually enjoy myself. What a lovely idea. Food can be put on the table (the good kind) without me standing on my feet for hours at a time. I can save dozens (or maybe even hundreds?) of dollars. Food tastes better. Gifts are more meaningful. I can actually look at the people around me and maybe I can even smile. Getting ahead saves my holiday. Want to join me? Most of the posts I’ll share will involve food prep suggestions and recipes. This doesn’t surprise you, I’m sure. Decorating is not my gift. Food though? I love it! Nothing will be fancy; everything will be tasty. It’s all real food. Would you like a peek at the menu we’ll be working through? All of this (with the exception of the Stir-and-Pour Dinner Rolls) can be made in advance. Some can be made many days in advance. Some should be made the day before. All of the recipes are simple. I’ll walk you through the entire process of methods I use to make these foods efficiently so I can enjoy time with family and guests! There will be recipes, printables…and I’m thinking there should be prizes. What do you think? Should there be prizes? Yes. Let there be prizes. Leave a comment on that post. There will be many posts in the coming days where you’ll spot that banner. The more you comment, the more chances you have to win! What will you win? How about we give away three $25 Gift Certificates good toward any of our eCourses or downloadable items in the Heavenly Homemakers Shop? Three! Sound good? 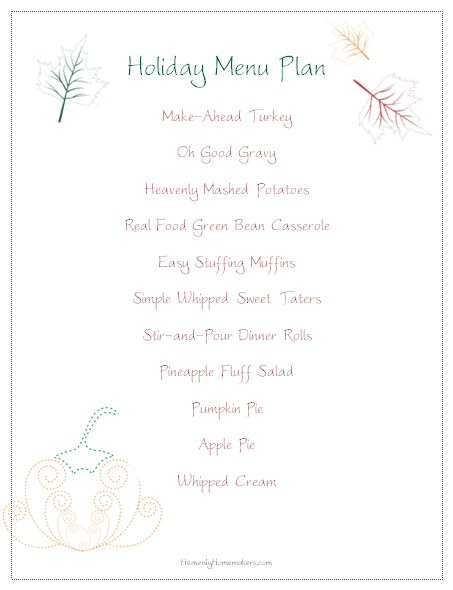 Which of the recipes in the Holiday Menu above are you most excited to see first?